With half price admission for all, and AAAF to cover the entry fee for people with alopecia, this is one not to miss! Save the date for Saturday the 16th of December. Meet us at the entry gate at 10:00AM, and join us for a fantastic day at the waterpark, celebrating our wonderful community. Lunch will be hosted at noon on the Coke Lawn – You can bring a packed lunch or purchase food and snacks at the park. During lunch, the AAAF would like to say thank you and have a group photo opportunity. To find out more about visiting Wet’N’Wild Sydney, including how to get there, where to park and what to – and not to – bring, check out the Wet’N’Wild website. 1. 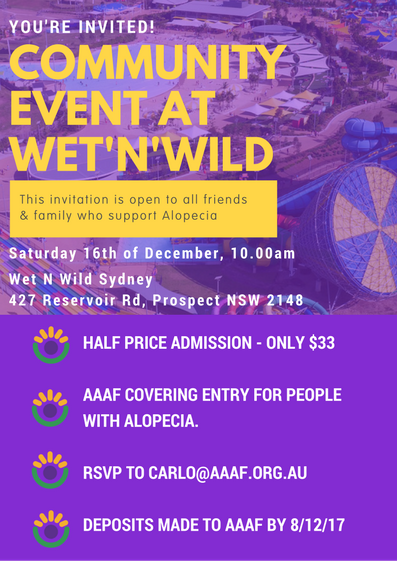 RSVP at carlo@aaaf.org.au with the total number of friends and family who will be coming with you, including anyone in your party with alopecia. 3. Meet us at the entry gates at 10.00am to receive your pass in. AAAF will reimburse entry fees for attendees with alopecia in cash on the day. Keen to attend this amazing event?